Prague has become one of the most popular tourist destinations in Europe. The city is known not only for its rich history and culture, but also for its cheap beer. Although the cheap prices of years past are gone, Prague's nightlife scene is among the best. There is no shortage of hostels that cater to backpackers looking to experience the nightlife. Many offer pub crawls or nightly parties, so its easy to meet like-minded travelers. The hostels below are just some of the favorites with party-goers. Clown and Bard is one of the most famous party hostels in all of Europe. It's staffed by young travelers who keep the atmosphere light and fun. There's an on-site bar that offers regular happy hours and cheap drinks. Live music is common as well. Clown and Bard is located in Zizkov, which is known for is diversity and local culture. There is no shortage of bars in the area as well as beer gardens, cafes, and restaurants. 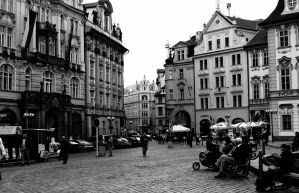 It's about three tram stops to Vaclovske Namesti, which is in the heart of Prague. If you want to stay somewhere affordable where it's easy to meet other travelers and have a good time, then this is a great option. The MadHouse Hostel offers backpackers a place where they can meet other travelers, enjoy a comfortable atmosphere, and have a good time. The hostel staff work hard to offer more than just a place to sleep and they focus on providing an all inclusive experience. There are regular activities for guests including beer pong tournaments, beer garden trips, and "family" dinners. Whether you're traveling alone or with friends, this hostel truly offers a fun experience. The hostel is located in a large house and can sleep about forty guests. There's a television lounge with a comfortable sofa and bean bag chairs. There's also wi-fi available throughout. If you're looking for a fun and welcoming place to stay in Prague, then MadHouse Hostel is an excellent choice. Hostel Elf is another popular party hostel in the Zizkov area. The hostel is about a five minute walk from the central bus station and is ten minutes from the train station. Hostel Elf offers all kinds of activities for guests. There are regular happy hours in the on-site bar. There are also barbecues, movie nights, and group dinners. If you're looking for a fun place to stay where you're sure to meet other guests, then this is your place. If sleep is a priority, then this may not be your best option. The hostel has a good amount of common space where guests can hang out. There's also a buffet breakfast served every morning. If you're traveling on a budget, but don't want to sacrifice on nightlife, then this is the place to stay in Prague. Hostel One Prague isn't just a place to stay, it's an experience. They've designed their hostel for backpackers, with friendly international staff who will do their absolute best to assist you in any way possible. They like to refer to themselves as 'professional party people', but they also have plenty of information to offer on the city. Originally an apartment complex, this hostel is better equipped than most - and offers an elevator for guests use. Each room is well designed and spacious, equipped with its own bathroom and shower with endless hot water. Linens are included, and your bed is already made. The kitchen is open 24/7, with free tea and coffee and is fully equipped for you to cook a delicious meal. The TV lounge is a great place to relax with comfy couches, cable TV, a guitar, loads of DVDs, and a Nintendo 64. Computers in the computer room are free to use and have fast internet access. The Rave Cave, the on-site bar, offers good music and cheap drinks before a night out clubbing. Outdoor areas include balconies, patios, or a beautiful garden. Free city maps, Wi-Fi, and linens are included and towels are available for hire. PLUS Prague is a recently-renovated hostel in Holesovice with modern facilities. Just a short ride on the tram from Prague's stunning historic city center, the hostel boasts a free sauna, and indoor saltwater swimming pool open year-round. This is also the only Prague hostel with a fitness center, which is free if you book a private room. The rooms are big, bright, and airy with huge windows to let in the Czech sunshine. All rooms have an ensuite shower and bathroom. There are free crisp white bed linens and cozy duvets. The on-site restaurant serves up delicious and affordable meals, and there's an awesome bar to party with people from all around the world. Unique to PLUS Prague is 'PLUS Girls'. This 'girls-only' space allows you to forget you're a backpacker and be a girl again. There are big bathrooms, cosmetic tables with large mirrors and hairdryers. When you check in you'll receive a nice fluffy towel to use during your stay and a complimentary cosmetics bag stuffed with goodies for you to take along. Guests under 16 are only permitted in private rooms with parent or guardian; they cannot stay in dorm rooms.